The Swordfish 1000XCD 10-Sheet Cross Cut Shredder features 4 castors for easy mobility and can easily sit under or alongside a desk. Ideal for either home or small office use, the shredder cuts an A4 sheet into approximately 400 pieces, measuring 4 x 39mm. This small particle size means the shredder has a DIN P-4 security rating, making it perfect for the shredding of highly confidential material. The shredder can get through approximately 400 sheets of paper per hour and can also shred credit cards, small staples and CDs/DVDs (via the separate CD/DVD feed slot). The slide-out 17.1 litre waste bin will hold around 140 shredded sheets, more than enough for most small office and personal shredding requirements. 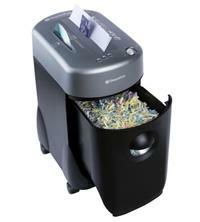 The Swordfish 1000XCD Cross-Cut Shredder comes with a number of additional features including a reverse function to help clear any paper jams and an auto start and stop control. It also has a 2 year manufacturer warranty covering both the machine and the cutting blades.